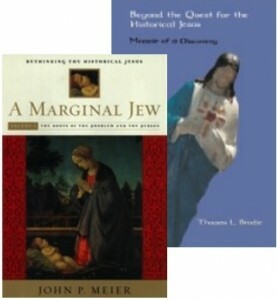 This post concludes chapter 17 where Brodie is analysing John Meier’s work, A Marginal Jew, as representative of the best that has been produced by notable scholars on the historical Jesus. Brodie’s discussion of the four Greco-Roman source references to Jesus is brief. Brodie adds that Tacitus regularly used older writings and always adapted their contents to his own style. As pointed out by Charlesworth and Townsend in the article on Tacitus in the 1970 Oxford Classical Dictionary Tacitus “rarely quotes verbatim”. By the time Tacitus wrote, Brodie remarks, some Gospels were decades old and “basic contact with Christians would have yielded such information.” His information could even have been inferred from the work of Josephus. I am even more sceptical about the contribution of Tacitus. Recently I posted The Late Invention of Polycarp’s Martyrdom (poorly and ambiguously title, I admit) drawing upon the work of Candida Moss in The Myth of Persecution. This brings us to the late fourth century monk Sulpicius Severus (discussed by Early Doherty in Jesus Neither God Nor Man, p. 618-621) who supplies us with the first possible indication of any awareness of the passage on Christian persecutions in the work of Tacitus. This topic requires a post of its own. Suffice it to say here that I believe there are reasonable grounds for suspecting that this detailed passage on the cruelties inflicted on the Christians was “borrowed” from the account written by Sulpicius Severus. Brodie thus concludes that none of the five non-Christian authors provides independent witness to the historical existence of Jesus. In chapter 17 Brodie is analysing John Meier’s work, A Marginal Jew, as representative of the best that has been produced by notable scholars on the historical Jesus. Brodie, “with a prayer to heaven, along with many saints and scholars, and also to Agatha Christie, Hercule Poirot, Sherlock Holmes, and Watson”, undertakes to examine how Meier came to this critical conclusion about the nature and significance of the evidence of Josephus. Authenticity: Do they really come from Josephus or from some later Christian writer/s? Independence: Even if the references are authentic, are they truly independent witnesses, of did Josephus get his information from other Christians or the Gospels? Bypassing the Jesus reference in The Jewish War as spurious according to virtually all scholars, Brodie zeroes in on Meier’s case for the evidence in Antiquities of the Jews. In Book 20, in a passage about a certain James, there is a passing reference to Jesus in order to identify this James: James was “the brother of Jesus who was called Christ”. Meier reasons that this passage appears to be referring to a Jesus mentioned earlier. It is very likely, then, that Josephus had earlier written about this Jesus. that Jesus appeared to his followers alive again three days after his crucifixion as the prophets had foretold. For alternative views of the passage in Book 20, especially those arguing against its reference to “the Christ” being original, see the posts in the James Passage archive. Some scholars still see the entirety of this passage as a total interpolation. But given the implication of the passing reference in Book 20 Meier believes it cannot be a complete forgery. Josephus must have said something about Jesus here. It is a mixture of original and insertion. Therefore #3 is Meier’s conclusion. Josephus said something, but he would not have said Jesus was more than a man, that he was the Christ, or that he rose from the dead. That is, omit the phrases that Josephus would not say and, presto, we are left with what Josephus would have said! And with these omissions “the flow of the thought is clear”, Meier adds. Brodie is happy to provisionally accept Meier’s conclusion as “a reasonable working hypothesis”. So he moves on to the next question. Making of a Mythicist — ch 17 . . . Was Jesus a Carpenter? He left that place and came to his home town, and his disciples followed him. On the sabbath he began to teach in the synagogue, and many who heard him were astounded. They said, ‘Where did this man get all this? What is this wisdom that has been given to him? What deeds of power are being done by his hands! Is not this the carpenter, the son of Mary and brother of James and Joses and Judas and Simon, and are not his sisters here with us?’ And they took offence at him. Then Jesus said to them, ‘Prophets are not without honour, except in their home town, and among their own kin, and in their own house.’ And he could do no deed of power there, except that he laid his hands on a few sick people and cured them. And he was amazed at their unbelief. Brodie argues that the common scholarly interpretations of this passage fail to take into account its literary background. Scholars have seen this passage as historical (not addressed by Brodie, but common among the scholarly works, is the view that this scene is “embarrassing” for early Christians because it shows Jesus being rejected by his family, so therefore must be historical) and Brodie singles out the disparaging dismissal of Jesus as a mere tekton (‘carpenter’ or ‘woodcutter’) as seeming to provide solid historical information. Making of a Mythicist — ch 17 . . . Did Jesus Model Himself on Elijah? Brodie is analysing John Meier’s work, A Marginal Jew, as representative of the best that has been produced by notable scholars on the historical Jesus. 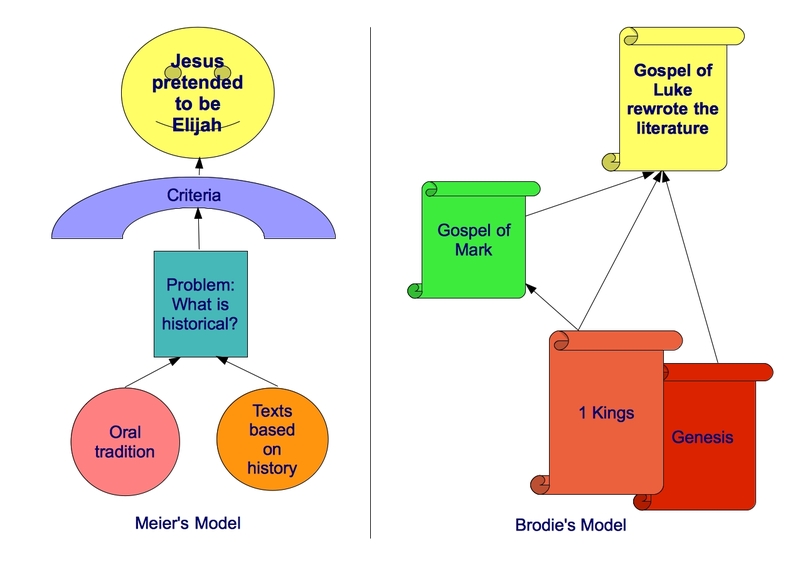 Having begun by identifying the two key problems of Meier’s work as (1) reliance upon the oral tradition model and (2) misreading the sources as windows to historical events as a result of failing to appreciate the true nature of those sources by means of literary analysis, Brodie next showed how these two problems misled scholars into the daunting task of attempting to sift the genuinely historical elements from the Gospel narratives. That task of divining the historical from the non-historical has led to the development of criteria. But Brodie argues that all of those criteria are flawed in some way (a point few of Brodie’s peers would disagree with; that is why they believe they are on stronger ground if they use several of them, never just one, and use them “judiciously”) but that several of them in particular are best and most simply and directed answered by a deeper and wider understanding of how ancient literary artists worked. Contradictions and discontinuities are a pervasive feature of the literary makeup of the Biblical texts and function in consciously planned ways. To add another illustrating example from the one I gave from Brodie himself in my previous post, this one not from Brodie but from my own reading of scholarly works comparing Herodotus’ Histories with the Primary History of Israel (Genesis to 2 Kings), a number of scholars have argued that the contradictory accounts of such events as David’s rise to power are set side-by-side just as Herodotus likewise pairs contradictory accounts of certain events in Greek history. The notable difference with the biblical literature is that in the work of Herodotus the author has intruded into the narrative the voice of a narrator to comment on these differences. The Gospels are following the style of the OT “histories” of removing, for most part, the directly intrusive narrator’s voice. The criterion of multiple attestation also fails since, according to Brodie, the various sources are not at all independent but are re-writings of one another. Re-writing and transforming texts was a singular feature of the literary compositional techniques of the day. inadequate engagement with the literary features of the sources. These two shortcomings in turn lead to further problems. The first of these is criteria. Brodie explains that by beginning with the assumption that the Gospels are derived from oral tradition, scholars are led to the “delicate operation” of trying to sift what is historical from the final narratives. So criteria of historicity have been developed. A Marginal Jew (like probably most historical Jesus works) relies heavily upon these. Most of us have read the methodological and logical flaws in these criteria, but Brodie does not address these here. Instead, he points out something about “contradictions and discontinuities” in the Biblical literature that only a handful of his peers seem to be conscious of. Contradictions and discontinuities are, Brodie reminds us, are prevalent throughout the books in the Bible. They are integral features of biblical literary artistry. It starts with Genesis. Man is first created in the image of God (1:26); then he is made of clay (2:7). First he is made to rule the earth (1:28); then he is made to serve it (2:5). Once again, it is highly unlikely that the Church would have taken pains to invent a saying that emphasized the ignorance of its risen Lord, only to turn around and seek to suppress it. Both of these sentences appear on page 169 of A Marginal Jew, volume 1, by John P. Meier (1991). 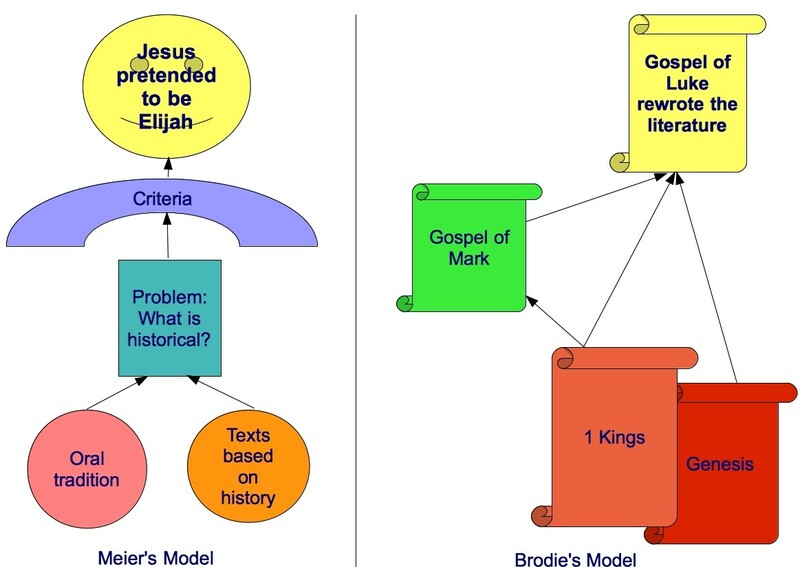 And both demonstrate how a biblical scholar is subject to the tyranny of the Gospel narrative when framing questions about the narrative’s historicity. Meier here has fallen into the trap of assuming that there was a single church entity that started out recording certain events on account of their historical nature, but over time came to see some of these as PR liabilities, and accordingly set about re-spinning them. But his scenario actually raises more questions than it answers, and there are simpler explanations for the existing evidence that it overlooks. I have discussed the fallacies at the heart of this criterion a number of times from different perspectives. The whole idea of using “criteria” to “discover bedrock evidence” is itself fallacious; this particular criterion stands in conflict with other criteria; and what the evidence points to is the embarrassment was over rival theologies or christologies among different communities, not over what we would call historical facts themselves. All of this has been discussed in previous posts that I have archived here. But since John P. Meier lists this criterion as # 1 of “primary criteria”, I am adding to those posts a response from a slightly different perspective this time.